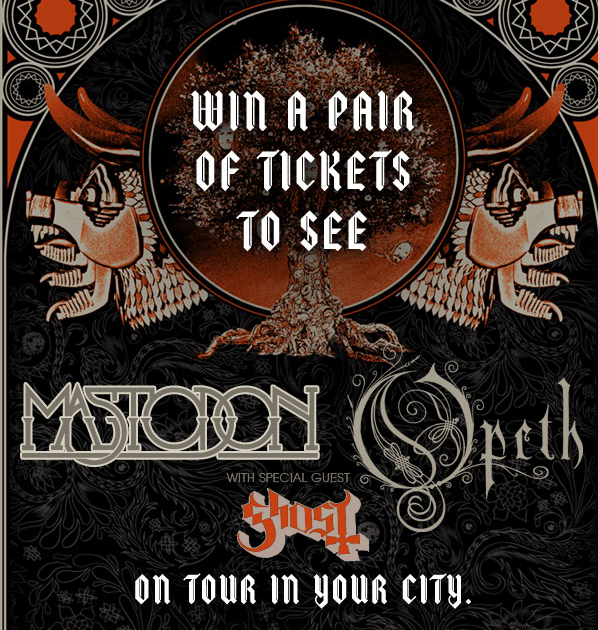 Continuing our exploration of Mastodon’s thunderous live show, here’s a chance to win free tickets to their upcoming US co-headlining tour with Opeth and special guests Ghost. To enter to win a pair of tickets in the city closest to you visit heritagehunter.warnerreprise.com. Full tour info is below. Good luck and let us know how the show goes. And like we told you before in our previous experiments and heavy metal podcast, Mastodon is an amazing band to experience live and we invite you to share your favorite Mastodon concert stories. Go ahead and drop a comment below or connect with us on Twitter @livefixmedia, Facebook , Google Plus, or call the concert fan hotline at 773-609-4341, and we’ll include them in a future episode of Live Fix Radio.